Reviewed by Zaya Huntsinger. Viewed at SBIFF 2018. The Virtuosos Award took place at the SBIFF on Saturday, February 3, 2018. 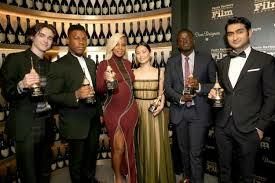 It was presented to people who have given breakthrough performances in film over the past year. These people included: Gal Gadot (Wonder Woman), Daniel Kaluuya (Get Out),Hong Chau (Downsizing), John Boyega (Detroit), Mary J. Blige (Mudbound), Kumail Nanjiani (The Big Sick), and Timothée Chalamet (Call Me by Your Name). The award was presented and moderated by Dave Karger. They were recognized impressive roles over the past year. Daniel Kaluuya was praised for his role as Chris Washington in the political thriller “Get Out.” Gal Gadot for her impressive acting as the lead in “Wonder Woman.” Hong Chau for her inspiring performance in the social comedy “Downsizing,” in which she plays the character Ngoc Lan Tran. John Boyega for his talented performance as Melvin Dismukes in the film “Detroit.” Kumail Nanjiani was awarded for his acting in “The Big Sick.” Previously known for her singer/songwriting, Mary J. Blige was given an award for her role as Florence Jackson in “Mudbound.” Timothée Chalamet was celebrated for his performance as Elio in Call Me By Your Name. The review that I will be reading will be on the film Virtuosos. The review on this film was pretty decent. I feel like I would’ve enjoyed this review more if the writer went into deeper detail into what this show was about. They also should’ve made the review at least a tad bit longer because it was really really short compared to other reviews. Other than that this review was decent. With this review I would still watch this show just because it is a an award show and it always keeps me interested watching people get handed awards. I like your review but I would like to have more details in it. It explain not very much compared with another reviews that I have seen so far. I have always liked the award so maybe I will see it one day. The Virtuosos Award took place at the Santa Barbara International Film Festival on February 3, 2018 and it was presented to those who have given breakthrough performances in film over the past year. I agree with Monica that the writer may have gone into a little more detail into what the show was about.